Pseudoaneurysm of the mitral-aortic fibrosa (PMAF) or intervalvular fibrosa is an uncommon condition, consisting of a pulsatile cavity in the mitral-aortic junction communicating with the left ventricular outflow tract (LVOT). The most frequent cause is aortic valve endocarditis, particularly in prosthetic valves. [1,2] When intervalvular fibrosa pseudoaneurysm communicates to both the left ventricle (LV) and left atrium (LA), eccentric jet flow from the anterior to posterior mitral annulus may occur during systole and mimic mitral regurgitation due to perforation in the anterior leaflet. A 24-year-old male was referred to our emergency room with a history of acute dyspnea of 2 days duration associated with orthopnea. At admission, he had NYHA class IV dyspnea. He had no history of prolonged fever, cough, or chest pain. On physical examination, his blood pressure was 100/60 mmHg and heart rate was 112/min. Examination of the lungs and heart revealed extensive crackles, grade 4/6 pan systolic murmur at the apex and gallops. Abdominal examination was within normal limits. No skin lesions were noted and the extremities did not show any peripheral edema. There was no clinical evidence of acute rheumatic activity or infective endocarditis. Electrocardiography showed sinus tachycardia. The chest X-ray showed mild cardiomegaly with a cardiothoracic ratio of 0.55 with evidence of pulmonary edema. Routine blood investigations were within a normal range. The erythrocyte sedimentation rate (ESR) was 35 mm at 1 h. The C-reactive protein (CRP) level was 2.2 mg/dl and antistreptolysin O (ASLO) titer was normal. 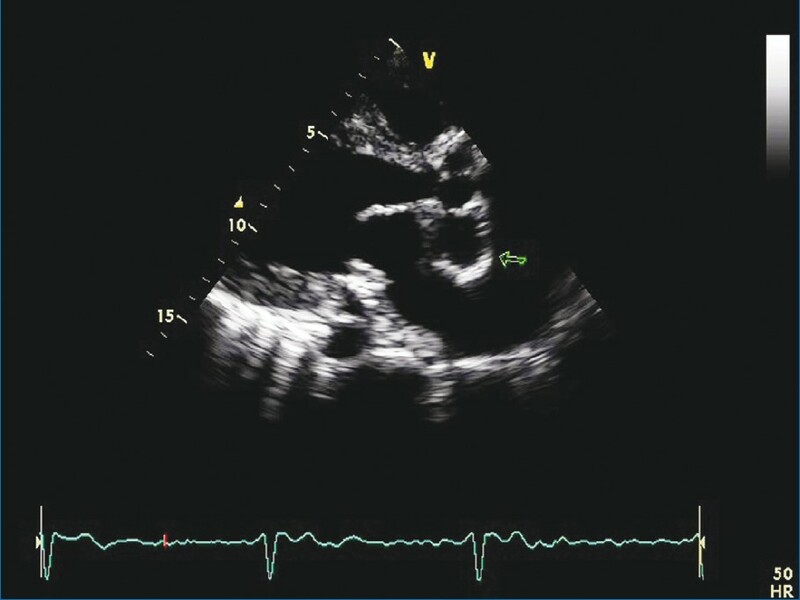 Two-dimensional transthoracic echocardiogram (TTE) demonstrated a false aneurysm-like structure in the MAIF at the LVOT [Figure 1], [Video 1]. It also demonstrated the neck of pseudoaneurysm communicating with the LVOT and also a defect in the aneurysmal wall communicating with the LA. The LA and LV were dilated. There was no echocardiographic evidence suggestive of rheumatic heart disease or infective endocarditis. 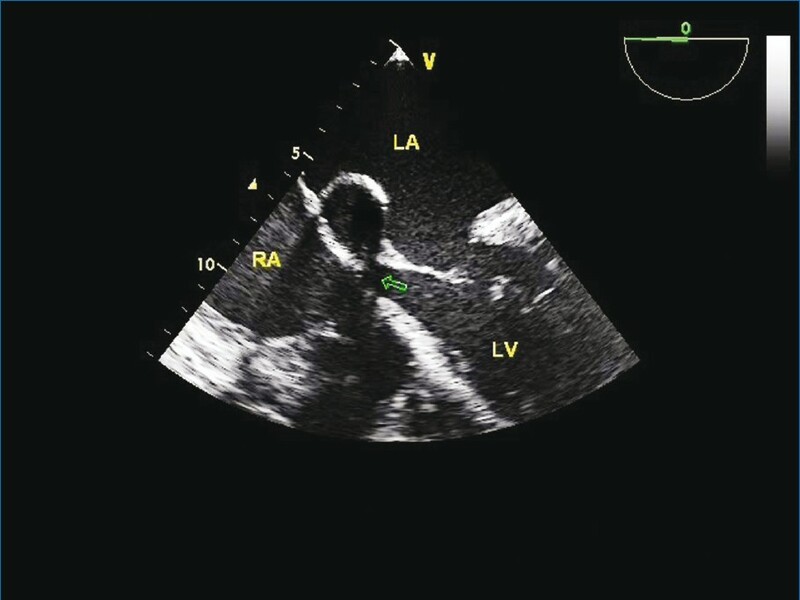 Color Doppler examination showed a communication between the echo-free space and LVOT and a turbulent flow through the defect in the aneurysmal wall into the LA [Figure 2], [Video 2] suggestive of supra-annular mitral regurgitation. Patient also had mild mitral valvular regurgitation. Cardiac systolic functions were normal. The mitral, aortic valve, and tricuspid valves were normal and there were no vegetations over mitral or aortic valves and no annular abscess. 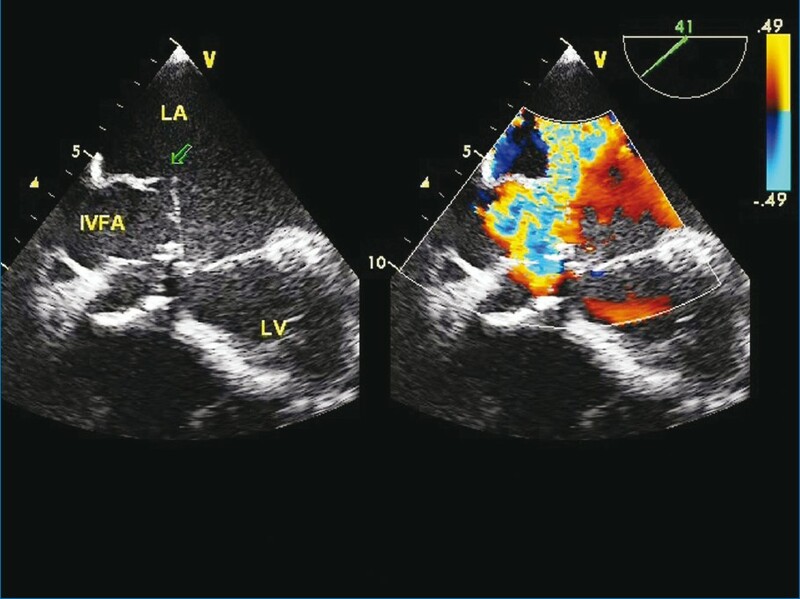 The diagnosis of a pseudoaneurysm of the MAIF was confirmed using transesophageal echocardiography (TEE). It demonstrated a large pseudoaneurysm of MAIF measuring 3.0 x 4.2 cm communicating with the LVOT through a narrow neck [Figure 3], [Video 3] and also rupture in its wall [Figure 4], [Video 4] resulting in communication between the LVOT and LA causing a large shunt. Serial blood cultures were class II symptoms at discharge. MAIF is the junction between the left half of the non-coronary cusp and the adjacent third of the left coronary cusp of the aortic valve and the anterior mitral leaflet. , Pseudoaneurysm of the MAF is a rare but potentially life-threatening complication of aortic valve endocarditis, aortic valve surgery, or chest trauma. , Aortic valve endocarditis is usually the main reason that predisposes the MAIF to perforate and form a pseudoaneurysm. Both direct extension of the infection from the aortic wall and the aortic jet striking the subaortic structures and anterior mitral leaflet may damage and infect the MAIF. The relatively avascular tissue of this region contributes to the extension of infection and subsequent distortion. Rupture of an MAIF pseudoaneurysm may give rise either to a pericardial tamponade, an eccentric jet of mitral regurgitation, or a direct communication between the LVOT and the LA. In some instances, the pseudoaneurysm remains intact and progressive enlargement may compress the coronary arteries causing symptomatic coronary obstruction. ,, These false aneurysms are prone to rupture, embolize, or even cause further destruction of the aortic or mitral valve apparatus. , When the pseudoaneurysm communicates with the ascending aorta or LV or LA; it may present as heart failure with a clinical picture similar to that of aortic or mitral regurgitation, respectively. Karalis and colleagues  described 24 (44%) complications involving 55 consecutive cases of aortic endocarditis, including 8 abscesses and aneurysms in interfibrosa, 7 interfibrosa perforations into the adjacent LA, and 9 anterior mitral aneurysms and perforations. However, in the present case, there was no evidence of the above-mentioned risk factors. TEE is known to be superior to TTE in the visualization of valvular vegetations, abscesses, and other complications in patients with infective endocarditis. TTE may show the aneurysm located behind the aortic root by the occurrence of systolic expansion and diastolic collapse seen by echocardiography. This should be differentiated from a typical aortic ring abscess which does not show this phenomenon. Color flow imaging is helpful in confirming this phenomenon. Both TTE and TEE can detect a pseudoaneurysm of the MAIF with sensitivity rates of 43% and 90%, respectively. 3D echocardiography may provide excellent three-dimensional anatomical information and also help in guiding the appropriate surgical therapy. To the best of our knowledge, it is rare for MAIF aneurysm to develop in the absence of aortic valve disease, infective endocarditis, prosthetic aortic valve, or trauma. MAIF aneurysm even though commonly associated with aortic valve endocarditis may occur in isolation. MAIF aneurysm can rupture into LA and can result in large LV to left atrial shunt. Both TTE and TEE are quite sensitive in identifying the relationship as well as complication resulting from rupture into surrounding structures, and also help in guiding the appropriate surgical therapy. 1. Karalis DG, Bansal RC, Hauck AJ, Ross JJ Jr, Applegate PM, Jutzy KR, et al. Transesophageal echocardiographic recognition of subaortic complications in aortic valve endocarditis. Circulation 1992;86:353-62. 2. Afridi I, Apostolidou MA, Saad RM, Zoghbi WA. 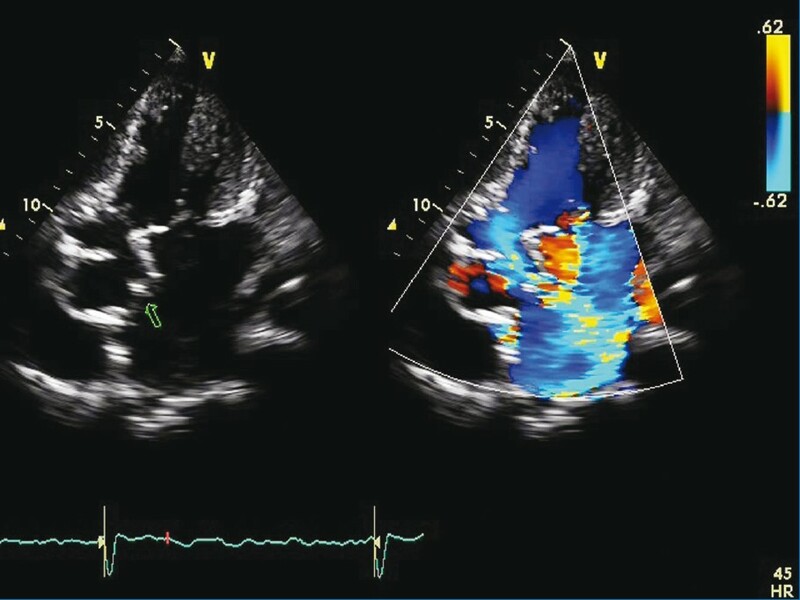 Pseudoaneuysm of the mitral-aortic intervalvular fibrosa: Dynamic characterization using transesophageal echocardiographic and Doppler techniques. J Am Coll Cardiol 1995;25:137-45. 3. Strauch JT, Wippermann J, Krep H, Wahlers T. Subannular perforation after long-lasting aortic valve replacement mimicking mitral insufficiency. Ann Thorac Surg 2008;85:11-3. 4. Parashara DK, Jacobs LE, Kotler MN, Yazdanfar S, Spielman SR, Janzer SF, et al. Angina caused by systolic compression of the left coronary artery as a result of pseudoaneurysm of the mitral-aortic intervalvular fibrosa. Am Heart J 1995; 129:417-21. 5. Espinosa-Caliani JS, Montijano A, Melero JM, Montiel A. Pseudoaneurysm in the mitral-aortic intervalvular fibrosa. A cause of mitral regurgitation. Eur J Cardiothorac Surg 2000;17:757-9. 6. Daniel WG, Mügge A, Martin RP, Lindert O, Hausmann D, Nonnast-Daniel B, et al. Improvement in the diagnosis of abscesses associated with endocarditis by transesophageal echocardiography. N Engl J Med 1991;324:795-800. 7. Almeida J, Pinho P, Torres JP, Garcia JM, Maciel MJ, Lima CA, et al. Pseudoaneurysm of the mitral-aortic fibrosa: Myocardial ischemia secondary to left coronary compression. J Am Soc Echocardiogr 2002;15:96-8. 8. Antonellis J, Kostopoulos K, Routoulas T, Patsilinakos S, Kranidis A, Salahas A, et al. Aneurysm of the mitral-aortic intervalvular fibrosa as a rare cause of angina pectoris: angiographic demonstration. Cathet Cardiovasc Diagn 1997;42:423-6. 9. Chesler E, Korns ME, Porter GE, Reyes CN, Edwards JE. False aneurysmof the left ventricle secondary to bacterial endocarditis with perforation of the mitral-aortic intervalvular fibrosa. Circulation 1968;37:518-23. 10. Shively BK, Gurule FT, Roldan CA, Leggett JH, Schiller NB. Diagnostic value of transesophageal compared with transthoracic echocardiography in infective endocarditis. J Am Coll Cardiol 1991;18:391-7. 12. Aoyagi S, Fukunaga S, Otsuka H, Akaiwa K, Yokokura Y, Yokokura H. Left ventricular outflow tract pseudoaneurysm after aortic valve replacement: Case report. J Heart Valve Dis 2004;13:145-8. 13. Quizibash AH, Schwartz CJ. False aneurysm of left ventricle due to perforation of mitral-aortic intervalvular fibrosa with rupture and cardiac tamponade. Am J Cardiol 1973;32:110-13. 14. Jiménez Valero S, García E, González Pinto A, Delcán LJ. Percutaneous closure of pseudoaneurysm of the mitral-aortic intervalvular fibrosa. Rev Esp Cardiol 2005;58:1473-5.